It was an exciting week for the Los Angeles Community. It began with the arrival of the Bnai Brak Chernobler Rebbe, Rav Menachem Nachum (ben Meshulem Zushe) Twersky, shlita. The Rebbe arrived on Wednesday the 20th of Adar 5775 and stayed until the following Wednesday. This particular week, the community also hosted visits by a conglomerate of Gedolim and Roshei Yeshivas who descended from for Shabbos parshas Vayakhel Pekudai to our city. On Wednesday evening, Rav Chaim Boruch Rubin, Rov of Kehilas Etz Chaim of Hancock Park, hosted a kabolas panim in honor of the Rebbe’s visit. Prominent Rabbanim, Chasidim and Baale Batim came to rejoice in the Rebbe’s visit, extend a shalom aleichem and receive his bracha. The Rebbe shlita, who carries responsibility for a network of Torah institutions, made the strenuous trip to Los Angeles on behalf of the Chernobyl yeshivos and kollelim. The history of the Chernobyl Chasidic Dynasty goes back to Reb Nachum of Chernobyl (1730-1797), a talmid of the Baal Shem Tov and Reb Dov Ber, the Magid of Mezritsh. It was Reb Nachum’s son, Reb Mordechai Motele (1770-1837) who adopted the surname Twersky and transformed his followers into a mass movement. Reb Motele was known as the Chernobyler Magid. By the mid19th century, Reb Motele’s eight sons had established themselves as Chasidic leaders. Motele was succeeded in Chernobyl by his eldest son, Aharon (1787-1871), while each of his other sons moved to a different town in the Ukraine. It was from these sons that blossomed forth the Rebbes of Chernobyl, Cherkas, Trisk, Talne, Makarov, Skver, Rachmastrivka, Hornosteipl, Machn-ovka and several others. The Bnai Brak Chernobler Rebbe, Rav Menachem Nachum Twersky, shlita, is a direct descendant of the Chernobyl Dynasty. 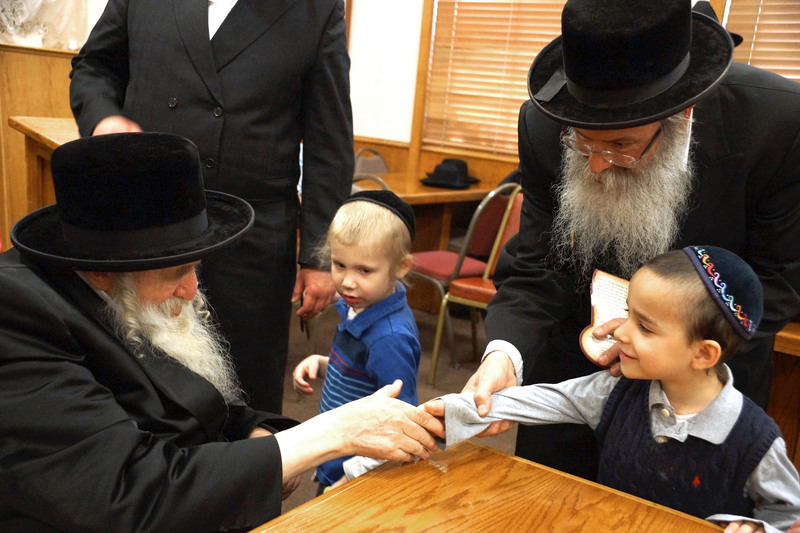 On Thursday, the Rebbe visited with the students of Yeshiva Rav Isacsohn where he commended the children on their learning accomplishments and presented each talmid with a gift. In the evening the Rebbe attended a seudah at the Chasidishe Kollel commemorating the yahrtzeit of Reb Elimelech of Lizhensk zt’l. He then went to visit with Rav Avrohom Halberstam, a family relative. The Rebbe davened Shabbos at the Chasiddishe Kollel and conducted a tisch later in the evening. During his stay in Los Angeles the Rebbe also visited the talmidim at the Los Angeles Cheder, the soul of our chassidishe community. On Motzei Shabbos, the community attended a Melave Malka in the home of Reb Yissachar Dov Weiss, host of the Rebbe’s visit. Amid the dancing and singing, the guests heard Divrei Torah from the Rebbe and were recipients of shiurim. His visit to Los Angeles provided us with a chance to stand in the Rebbe’s daled amos, something highly unlikely to occur on a visit to the Rebbe in Bnai Brak. Those who took the opportunity to see and hear from the Rebbe were inspired and impressed by his words of Torah and the warmth of his personality. May we merit more of these opportunities.